Timber and iron are the characteristic materials used to construct Queensland houses. Sawmilling was established in Queensland in the 1850s, and timber became readily available for construction. Iron could be transported long distances throughout the Queensland colony, and was more durable in tropical storms than tiles. These readily available and affordable materials were also easy to use and so contributed to the popularity of the Queensland house. The materials also directly affected their form. Timber was a light, inexpensive material, but it was vulnerable to attack from termites. Houses were constructed on stumps to raise them off the ground, and the stumps were capped with plates to prevent white ants from getting to the wooden superstructures. The greater height also allowed easier surveillance of termite activity. The warm Queensland climate further contributed to the form and popularity of Queenslanders. The high heat conductivity of tin iron roofing and the poor insulation offered by timber meant that ventilation was critical. 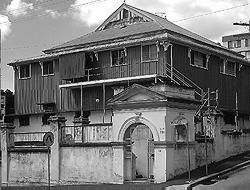 Queensland houses were usually constructed to face the street, irrespective of the direction of sun and wind. Houses belonging to affluent members of society were more likely to be situated in higher locations and constructed with more windows to take greater advantage of prevailing breezes. Nevertheless the raised structures provided natural ventilation beneath and around the house, and airflow was enhanced by numerous windows, louvers and fretwork fanlights. Verandahs proved popular in providing additional living space that was outdoors yet protected.